Whew! it isn’t a big problem after all, and the Intuit development team has a fairly simple fix for us. My apologies to everyone for stirring things up, and my thanks to Sam and Siddharth (and others) at Intuit for helping with this. Yesterday I released a posting about a verification error in QuickBooks 2011 Release R4 that prevented us from verifying (and doing a verified backup) of our QuickBooks company file. This did create a big problem as it prevented you from performing a necessary task. The good news is that it is easily fixed. The bad news (added to the end of the article) is that there may be another problem for some users. Intuit has us shut off a message that is erroneously making the Verify fail. There is a message that is showing up in the QBWIN.LOG file (refer back to the earlier article, I pointed this out) which is not flagged as an error. But Verify picks up on that and takes it as an error. It is really just an informational message, not an indication of a real problem. By turning off this message, the Verification error goes away without compromising your data or performance. 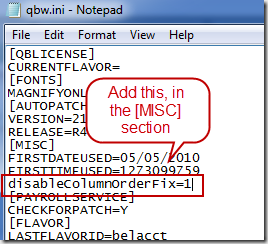 To fix this, you will need to edit your QBW.INI file. If you aren’t comfortable with doing this, get a ProAdvisor to help you. 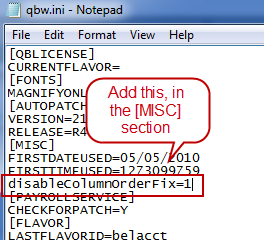 Note that in SOME systems you may have multiple QBW.INI files, and it is important that you get the right one. Detailed instructions can be found in KB article 899405 – you should review this in detail. If you aren’t sure about editing your QBW.INI file, make a backup copy of it first. If your file did NOT verify properly BEFORE installing R4, it still won’t verify. You have to fix the “real” verification errors (that held me up in one of my test files while figuring this out). Make sure that you find the RIGHT QBW.INI file – you may have several in different places. If all else fails, change them all. Again, I confirmed with Intuit that turning this flag off does not disable any feature you need, and that the problem does not indicate that you have damaged data. So, I’m going back to recommending that if you are running QuickBooks 2011, you should upgrade to R4 to get all of the benefits that this release brings. Thanks Charlie – I am sure that your work with the tech quys at Intuit helped to really get the ball rolling on getting this fix (no matter how simple it is) ‘out the door’ so quickly. And I don’t think you need to apologize at all for “stiring anything up” because all you did was open our eyes to a problem that really did need attention, and apparently it got Intuit’s attention. It is kind of disturbing that some people got run around Level 1 and Level 2 tech support and even no answers from Data Services about this over the last week or so, before it got on all the blogs and a lot of people like yourself got involved to help get it fixed. So once again, a Big Thank You ! I appreciate your updates – thank you. Hi Charlie, I do not yet have any client on 2011, but knowing that you are on our side, “stirring the pot”, and working with Intuit gives me comfort. I figure that I will be well versed when it is time to bring the clients on…. Thank you!!! Have a wonderful holidsy and I wish you (even more) success in 2011. IS THIS FIX REQUIRED ON EACH MULTI USER FILE? Jerry – the fix is to change the QBW.INI file – and that is common to all company files on your computer. That is, the file is stored on each computer, but only one copy per version/year of QuickBooks. Charlie: Trying the solution but unable to get the qbw.ini in notepad.%programdata% not working?? Charlie: Back again. Could not verify on pc with the fix made as seen above. Performed a verified backup on a pc without the updates and restored this backup on the pc with the updates. Still would not verify. Any help? Jerry, my apologies, I deleted a few of your comments as they tended to be duplicates. Providing support via a blog like this is difficult to do, as there are many variables involved. You may want to contact a local ProAdvisor. If you have had multiple versions of QuickBooks installed (Premier and Enterprise, or multiple years of the same product) you could have multiple QBW.INI files on your computer. Even with one version, in some cases you have multiples. And they often are found in “hidden” folders that you might not be able to see with Windows Explorer. I don’t usually tell people about how to find “hidden” folders via blog comments – I don’t like mucking around in your system if I can’t see it. One option – open QuickBooks, then press the F2 key. This should open a “product information” window. When in that window, press F3. This will open a “tech help” window. Be careful what you change – there are things you don’t want to fool with here. Select the “open file” tab, click on the QBW.INI file in the list. Just click on that one file – it lets you select multiples. Once selected, click the “open file” button. This SHOULD open the proper QBW.INI file – this isn’t guaranteed. I thought it was guaranteed until and Intuit tech person showed me that in SOME situations there may be two copies of the file that are active. In any case, once you have that file open, Find the [MISC] section, and add the phrase disableColumnOrderFix=1 in a line by itself. Anywhere after [MISC] but before the next section marked with square brackets. Save the file, exit QuickBooks, restart it. NOTE that I was doing this in single user mode, I didn’t check if the mode mattered. If this doesn’t work, and you still have verify errors, it is very possible that you have some OTHER errors in your file that need to be fixed in addition to the original one. You should, at that point, get help from a ProAdvisor or Intuit tech support. states file needs reordering. how????? Jerry, the “reordering” message isn’t an error – you can ignore that. Other than to note that by seeing this in your file, you haven’t successfully turned off the message that this article is talking about. Charlie: That comment helps but I’ve done everything to turn it off and will continue to try. You mentioned that the ad re: online backup was turned off but it still shows up on mine. I do not have multiple versions installed. Now using Win7 on an Imac and the F2 and F3 keys do not reveal the necessary logs. Jerry, are you running a Mac version of QuickBooks? If so, none of this applies. If you are running Windows 7 under a Mac system, there are some keys that don’t work correctly. At this point I’m going to say that you need to talk to Intuit tech support, or a ProAdvisor, who can actually work with you on your system. This isn’t something that can be worked out individually in blog comments. Sorry! Charles: Your comment that the fix was not yet done focused me on that point. I found some errors, corrected them and all is well. Your help and patience has never been more appreciated. Have a great holiday and an even greater year in 2011. R4 also has a problem with templates. When you attempt to make a new invoice template it causes an unrecoverable error. Also when I attempt to edit an existing invoice template. I spent two hours with tech support only to be told that this is a known problem and is not fixed yet. Rick, I hadn’t heard that one yet. Also, I’m not seeing the problem here, so it must not affect all people. I can edit templates, “duplicate” templates, and more, without any problems. But we often see problems that show on one compute but not another. I am running QB Mac 2011, and cannot verify data after trying several time. Is there a way fix this on Mac as well. Raquel, unfortunately I don’t work with the Mac version, so I don’t have an answer for you. I have the Same problem, no template modification ability, it Just simply crashes my machine. Im about to give up on QB as without being able to create a custom invoice it’s completely useless to me and has been a complete waste of my time. It sounds like this particular error is in the R4 release – and I’ll note that it doesn’t affect everyone. I’ve never run into it myself so I’ve not been able to play with this. They provide four possible solutions – one of which is to roll back to R3. I just upgraded to QB Pro 2011. I have tried IE 8 and now IE 9 and my loan manager won’t load. In IE 8, I was able to start loading and got a message…Your browser blocked download for security reasons. I clicked download file and it did not do a thing. In IE 9, a window popped up. Adobe can’t ….vbd file or the file was damaged or was sent as an email attachment….Please advise. my loan manager does not load. Allison, I don’t have that issue with IE8 – it sounds like you have the security settings of your browser set too high. There is a VBD (a Visual Basic Document, which is an older form of ActiveX) that is being loaded, and I’d guess that you have security set to not allow that.